You may be wondering why, almost two weeks after Christmas, I’m mentioning this delicious cake, and I could come up with a million fitting excuses, but the reason is simple: the first one disappeared before I had a chance to play with some leftovers! So, yesterday I went out and bought another one to turn it into this delicious 2 ingredient Christmas cake chunk ice cream. I know, I know, Christmas cake is not everyone’s cup of tea, but trust me when I say this one is good: moist and filled with the sweetness of dried cherries, currants and raisings. Even haters will fall in love with the delicious swirls of juicy fruit and big almost brownie-like cake chunks in this lot. That’s the thing about ice cream, it makes everyting taste even better. If that’s not convincing enough, Bakers Delight stores across Australia are now selling the cake at half price (originally $15) and it comes in a pretty aluminum tin which you can reuse to keep craft bits and pieces. I’ll be storing ribbons in mine. And there is no ice cream machine required to make this delicious treat. Just a tub of your favourite vanilla ice cream or if you are still trying to lose that extra kilo or two after Christmas, feel free to use frozen yoghurt instead. Both work a treat so now you can go and eat yourself silly. Again. If you’d like to make the cake more convincing to your tastebuds and you like chocolate, add about 1/4 cup of roughly chopped choc chips into the mix. You won’t be diappointed. Vanilla ice cream or frozen yoghurt work best, but I can imagine that dulce de leche flavour would also work. To make the ice cream: soften vanilla ice cream or frozen yoghurt for about 5 minutes on the kitchen bench. Trasfer to a bowl and add Chrismas cake chunks. Using a spoon, quickly cut and mix the cake through the ice cream before it melts completely. Treasfer into a freezer-safe container and freeze until set. To serve: scoop ice cream into a bowl or cone and serve with a nip of brandy or a shot of espresso. Hot chocolate sauce for the kids. Wholesome Cook received one of the Bakers Delight Christmas cakes from KeepLeft Public Relations. 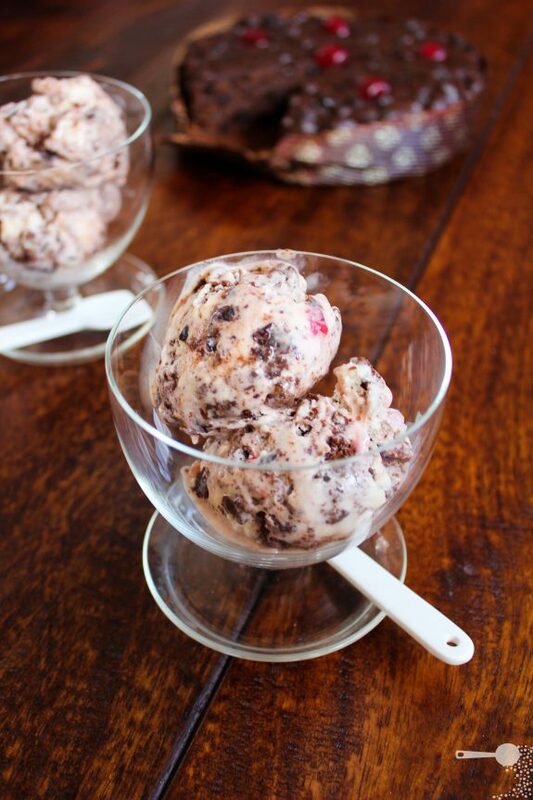 Ok, so my mum and aunty used to make Christmas pudding ice cream… but the recipe was long and arduous. GAH. So I’ve never made it…. plus we don’t have an ice cream maker…. but this! THIS! Could be the answer to my prayers!!! Bookmarking the page and bringing it up again at Christmas time. Great shots! I’ve tried the cake this year and really liked it too! Brilliant idea, especially with the frozen yoghurt. You are a genius, love your blog and surpisingly delicious and simple meals every time. I will be trying this for sure, using my Grandmother’s one and only Christmas pudding! That is some pretty freakin’ incredible looking ice cream!!! Yum, I love the Baker’s Delight xmas cake, and putting it in ice cream is just genius! Nice way to use up that Christmas cake. Great idea; the whole is greater than the sum of its parts! Yum, I love the xmas cake, and putting it in ice cream is just genius!